During repetitive overhead and lifting sports and occupations, the elbow experiences tremendous stress. This may lead to the formation of small loose fragments of cartilage or bone (loose bodies) or elbow joint spurs. This is more common in heavy manual workers and weightlifting athletes. 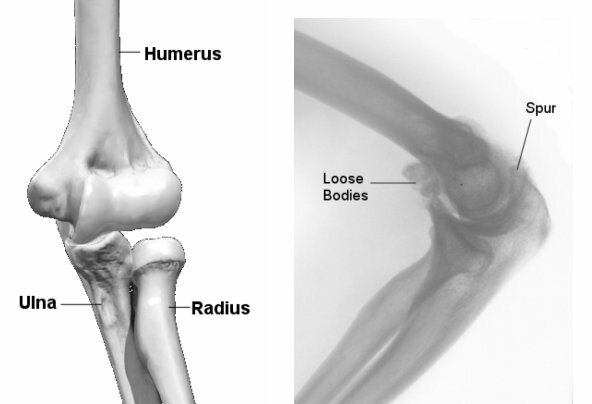 The loose bodies can cause pain, clicking or locking of your elbow. Your elbow may get ‘stuck’ and then click free (unlock). This is often painful. Sometimes you may feel something moving around inside your elbow joint and be aware of the loose body. If stiffness and early morning discomfort is associated with this then arthritis might be present. Painkillers and physiotherapy are often helpful, but if the symptoms are severe and debilitating removal of the loose bodies by arthroscopy or open surgery is indicated. Arthroscopic removal is becoming the treatment of choice nowadays.